The Homestyle patio canopy and car port is one of our most popular products. This polycarbonate roof canopy combines a high quality design with an easy to install interlocking roof system. The canopy is suitable for a variety of uses such as an elegant patio cover, veranda or outdoor eating area. The roof bars rise above the roof rather than falling below it for a smooth, neat underside that won't gather cobwebs and dust. 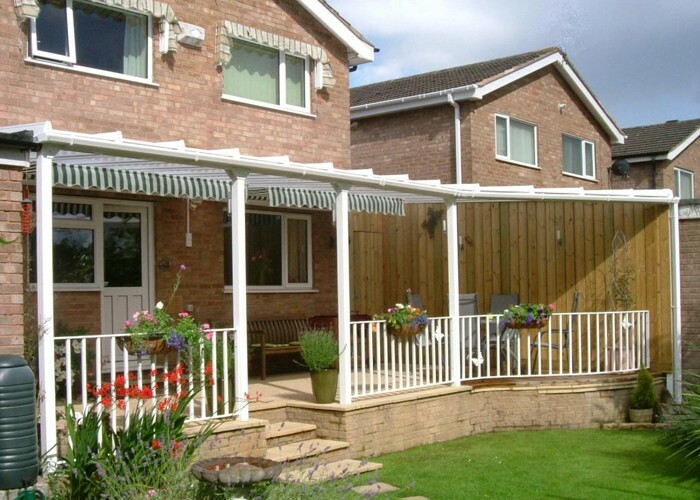 A canopy helps you spend more time enjoying your garden whilst protecting you from sudden changes in the weather. 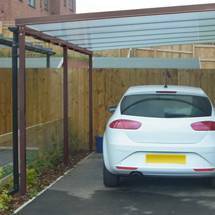 Equally suited to a stylish carport, the Homestyle canopy is made from long lasting powdercoated aluminium and shatterproof polycarbonate. 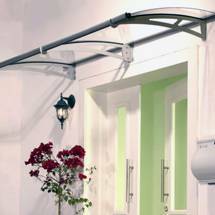 The Homestyle canopy has been around for over 15 years through the best and worst of the Great British weather. It has a strong dedicated box section eaves beam for extra strength rather than an integral gutter/ eaves beam. 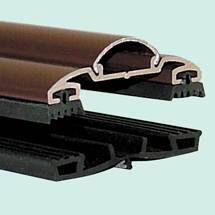 All guttering and free delivery within mainland UK are included with your order. Our canopies are supplied as a kit and come with detailed assembly instructions for a hassle free installation. 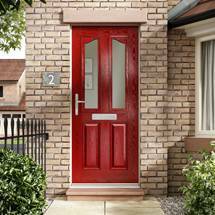 The canopy is simple to install but if you would prefer us to do it for you we also offer a fitting service in a number of areas. To get a price or to order online, simply select from the options below. If you don't see the size you are looking for or need any more help please give us a call on 01536 446395, we are here to help! We offer our Homestyle Canopy in a range of standard kits with varying projections (distance from the wall) and lengths (distance along the wall). If you are struggling to work out which size you need or if you would like a canopy manufactured to your own particular specifications then please contact us on 01536 446395. Can’t find the size you need? Click here to find out how to order a size we don’t stock and the measurements you will need. The 1.5m, 2.5m and 3m Projection Homestyle Patio Canopies are available in a range of lengths; supplied with 10mm thick twinwall polycarbonate sheets. The 3.5m and 4m Projection Canopies are also available in a range of lengths; supplied with 16mm thick triplewall polycarbonate sheets. The front of the Homestyle Lean To canopy is supported by posts and the rear is attached to the wall. The standard sized canopy posts are 2.5m in height and are designed to be buried in the ground into concrete pads. Canopy posts are also available as 3m or 3.5m height. The Patio Canopy Kit includes: Powdercoated Aluminium Eaves Beam and Glazing Panels (White or Brown Frame); Polycarbonate Glazing (Opal, Clear or Bronze Tinted Roof Panels); Canopy Posts; and Rainwater Kit and fixing pack (Please note wall fixings are not included as these are specific to your surface). How do I order a bespoke sized canopy? How many legs will my Homestyle Canopy have?